Our last trip to Maui—see two blogs ago—was…well…for lack of a better word, haunted. Haunted by bad luck. The first thing to go wrong was that my wallet was stolen. ON THE PLANE! I used my credit card to buy a sandwich from the stewardess and I can only guess that my wallet fell to the floor, slid under the seat and was picked up by an unscrupulous Doo-doo Head (excuse my French) upon landing. This was horrible for me for several reasons. Reason number one: IT WAS A BRIGHTON WALLET! $95! Never mind that I found it (Brand-spanking NEW) at St. Vincent DePaul’s. Yes! It still had the original Brighton stickers and packing material!! The good people at St. Vinnie’s didn’t know that it was worth far more than 2.99. Yes! What made it even better? My mother was with me and it was SUPER SAVER SATURDAY FOR SENIORS!! She scored a $95 Brighton for $1.50! Wahooie! Talk about a high! This was better than that time when Geraldo Rivera nearly found something in Al Capone/Jimmy Hoffa/whoever’s safe! Reason number three: IT HAD MY I.D. Now how was I supposed to check in to the resort? I wasn’t all that worried about not going home. Sorry, honey. Sorry kids. Maui isn’t the worst place in the world to be stranded. But…I was nobody! Just wait til I slather you with leather cleaner and silver polish! What is this? Why…IT’S A BRIGHTON WALLET! For $3.99!! A little worn—but much less than the one I just lost, being that I’d loved on that wallet for several years—and Bigger than my last wallet! 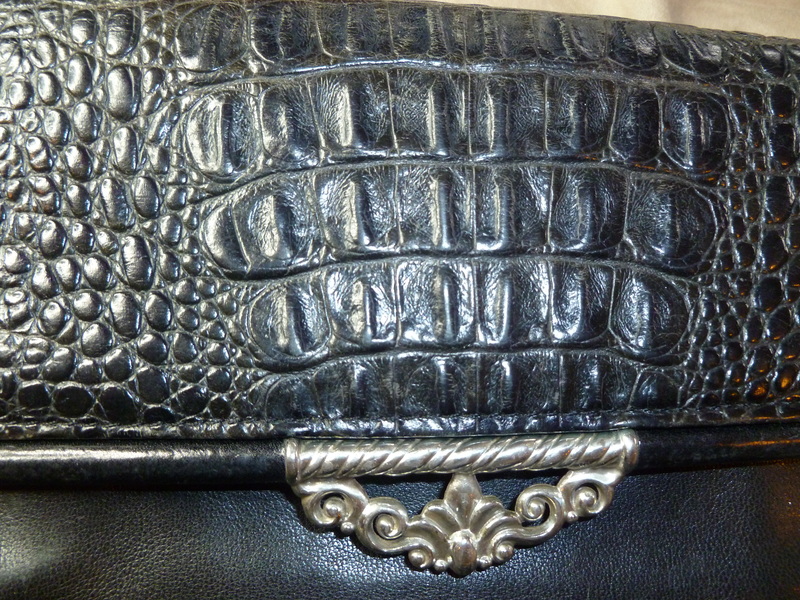 This one (in its heyday) probably retailed for $120-150 smackeroos. Oh, yeah. Thank you, Jesus!! My husband is going to detail/clean it for me (although it’s in awesome shape). I’ll relate the rest of our Maui misfortunes later. For now, I’m off to do some more treasure hunting at Goodwill. I can’t wait to see your “new” wallet! Will you be sporting it soon? SCORE!!!! 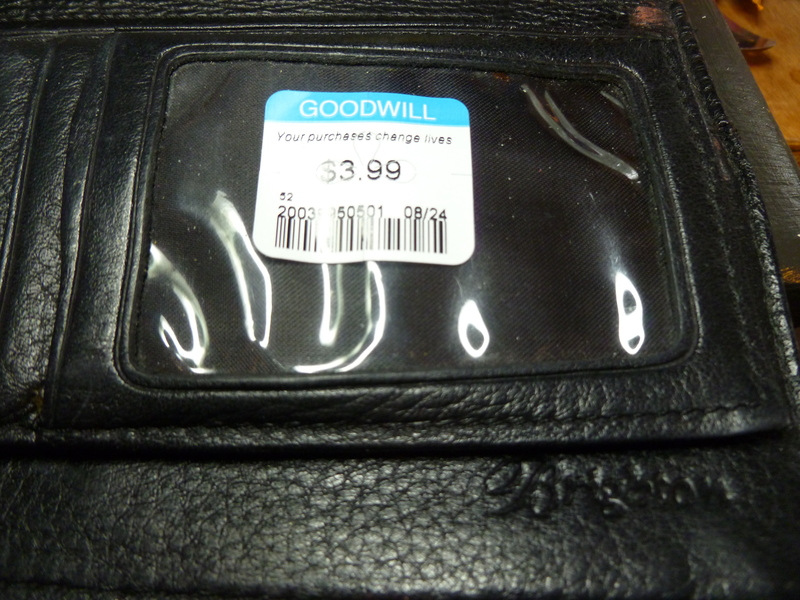 You shop at the nicest Goodwill and St Vinnies…I should be so lucky to score something that cool in my K Falls Goodwill!! !